These are true words, my friends. How often do we try to fruitlessly force a creative endeavor, when the most effective way to access creativity is through play and rest? If you need this permission from a friend, like I did, here you go: Go have fun and play and make DIY gifts. This is the first in a series of three DIY holiday gift recipes. Coming up next: Gingered Candied Pecans and Holiday Rooibos Tea. Stay tuned! 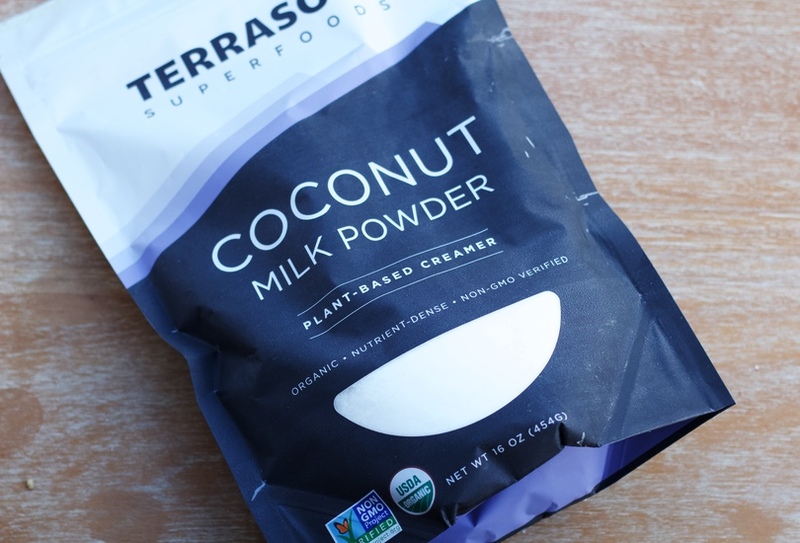 Coconut milk powder — I’ve seen some of my favorite brands, like Primal Kitchens and Vital Proteins, introduce powdered creamers with a base of coconut milk powder. (Such as this Coconut Protein Creamer, which I love in my morning tea.) 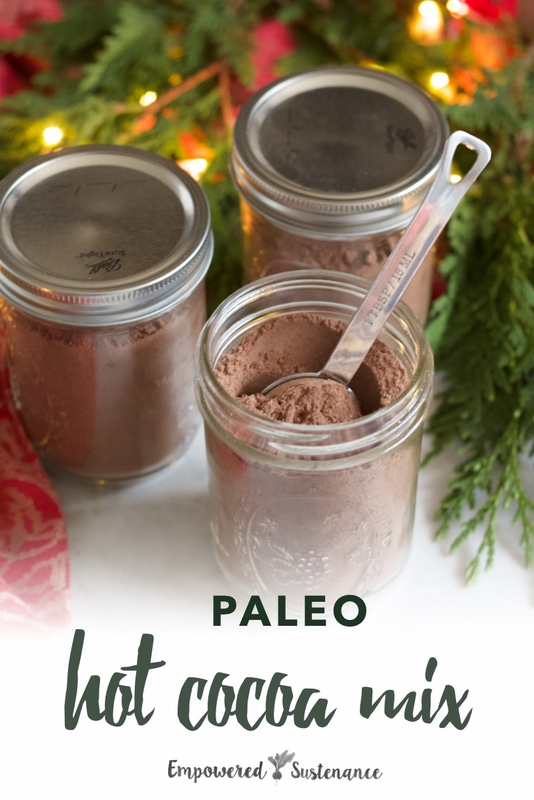 It turns out that coconut milk powder also makes a creamy base for a dairy-free hot cocoa mix. Coconut milk powder is available here. Coconut sugar — This unrefined sweetener made with coconut sap, higher in minerals and lower in glycemic index than refined sugar. It’s less sweet than refined sugar, also lends a slight brown sugar flavor which works beautifully in hot cocoa. 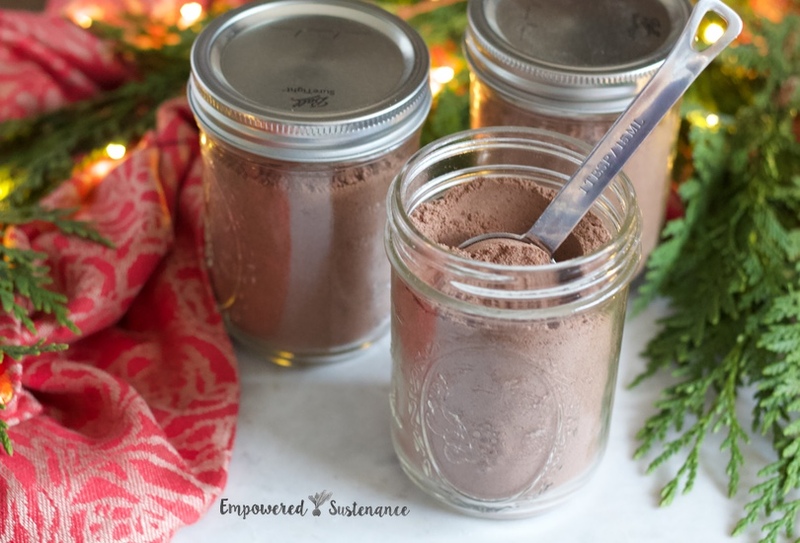 Cocoa powder — I use a basic, non-fancy, organic cocoa powder. But feel free to splurge on the Ghiradelli’s cocoa powder if desired. Add two heaping tablespoons of mix to 8oz of freshly boiled water, and stir briskly to dissolve. For a richer cocoa, use heated milk of your choice instead of water. Ingredients: coconut milk powder, coconut sugar, cocoa powder, and salt. Place the coconut sugar in a food processor and blend on High for 3-5 minutes, until it resembles powdered sugar. Add the remaining ingredients to the food processor. Put the lid on and shake to initially combine. Then pulse until the ingredients are combined. Don't over mix, just pulse until you get a smooth powder. The coconut milk powder tends to be clumpy so mixing in the food processor ensures a smooth cocoa mix. To make into hot cocoa: stir 2 heaping Tbs. of mix into 8 oz. freshly boiled water. For a richer hot cocoa, use hot milk of choice instead of water. To package for gifts: Distribute among glass jars for gifting. This makes 6 12-ounce Ball jars, filled to the 10-ounce mark. Feel free to use more smaller jars for packaging. See the above ingredients and instructions for printing out, to include with the jars. Use 2 heaping tablespoons of cocoa mix added to boiled water or hot milk of choice. Sounds delicious! I found out I was allergic to dairy a little over a year ago & the transition has been hard. Miss drinking hit chocolate in the winter. So thank you for this recipe. You’re welcome, and I hope you enjoy! In the tag/label ingredients, salt is mentioned but not in the recipe ingredients. How much salt? Thanks. Hello. What is the difference between cocoa powder and the cacao powder that you link to in the recipe? Are they interchangeable? Thanks. Yes, they are interchangeable! Both are unsweetened powders made from the cacao plant.